Indian Fields is proud to continue our partnership with Stance Equine, the manufacturers of Cool Stance and Power Stance. Cool Stance represents the latest and greatest in equine nutrition as a non-structural carbohydrate feed source. 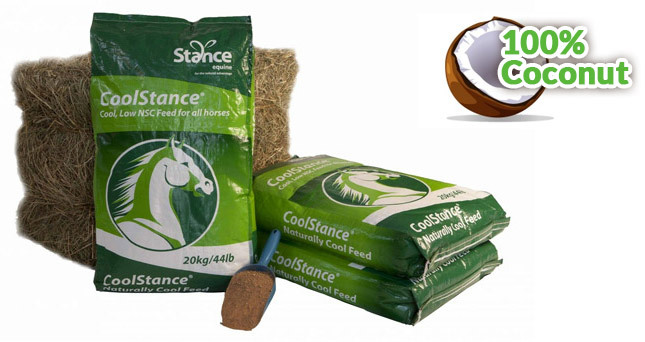 Providing great energy for both EMS and performance horses, Cool Stance can be fed on its own or in combination with a nutrient concentrate (such as Life Data Labs’ Barn Bag). PowerStance, Indian Fields’ newest Stance Equine product, is a concentrated coconut oil powder supplement packed full of saturated fats that increase muscle glycogen storage. PowerStance’s medium-chain triglycerides support gut health, weight maintenance, and coat health and shine. PowerStance can be fed to performance horses and hard keepers, without the side effects and stress on the horse’s digestive system that other supplements can create. PowerStance and CoolStance are both non-GMO products. Check out the Stance Equine YouTube page to learn more. Then, make sure you contact IFFS for more information about what CoolStance and PowerStance can do for your horse (also available for shipping from our online store)!